Behold, the PicoCube! 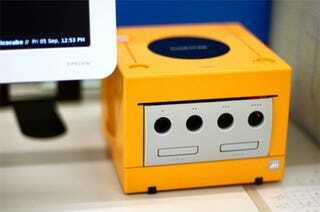 Half PC, half GameCube, all cute. Not only is it a fully-functioning PC (Pico-ITX, 1GB RAM, Pico PSU), with DVD slot and USB ports, it keeps the GameCube motif running through to its operating system, which is rocking a Mario-themed custom version of Ubuntu. Simply delightful.